I'm writing this blog post to tie in with the Anti-Bullying Blog Week being hosted by Sophie from A Day Dreamer's World. Look at the size of those glasses! I think my appearance has been the aspect of me that has been targeted the most by my bullies. As a young child, I always had really crap hair styles. Think 'bowl-cut' with a really dodgy, uneven fringe. Then there was the terrible idea of getting my hair permed during middle school. That was a disaster. That was followed by a short boy cut. The thing with this is that I really love my hair. I love the colour of it - it's dark brown with some very subtle rust coloured strands. Even now I find it really striking to see some bits of grey hair on my head. I will never, ever dye my hair because I love the colour of it too much. And I find it sad that for many years growing up, I really hated my hair. I wished upon many stars to be blonde and beautiful instead. I have always struggled with my weight. This has been an aspect of my life since I was a pre-teen and that thought depresses me so much. Why was I was worrying about my weight at such a young age? Why is any young person? I was bullied a lot for being overweight. I ended up quitting the sports teams that I loved so much because of how self-conscious I felt about my body. What I'd really love to do, and I wish I'd been doing this all along, is to join a martial arts class in the area or to swim regularly. Who cares about the size of my thighs or that my stomach isn't quite flat, right? I have been wearing glasses since before I was three years old. At first they were these horrible, thick Coke bottle lenses that really magnified my eyes and face. And until I was a teenager they were also plastic frames with really bright colours - pink, purple, red. Colours that really stood out. My glasses were something that I was picked on for many years. There would be name-calling and people would steal my glasses, they were broken at different times. I had to wear a 'dork strap' when I was playing sports. It was all very traumatic. I look back at pictures of me with those glasses and I think they're adorable. Plus, I had no control over my imperfect eyesight. 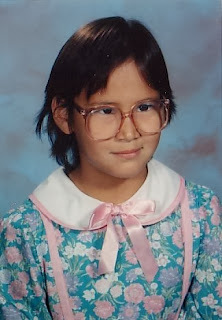 I've talked about it on this blog before: I am half Native-Alaskan. My mother is from the Tlingit tribe who live in Southeast Alaska and when I was much younger she and I would spend time together making Native American arts and crafts. Those memories that I have with her are amongst my favourite and happiest memories of my childhood. I am very proud of my heritage ...but there were times in my life when I wasn't. When I was much younger, my skin colour was fairly dark. It was much more obvious than it is now that my background was different to all the other little white boys and girls that I went to school with. The town that I grew up in (8+) was not a very diverse place to live. In my elementary school there was one half-Korean girl, one black girl and my brother and me. Later, in other schools there would be slightly more differing backgrounds but still not very many. I dealt with so much racial bullying and name-calling growing up that it actually pains me to recall it all. My brother got into physical fights on a regular basis and for him that seemed to work. I was not so lucky. There is a Mexican fast food restaurant that was in our town, Taco Time. In their meal deals they include a small portion of tater tots that they called 'Mexi-tots.' Mexi-tot was actually my 'nickname' at that school (before I transferred out of it) and I'd get quite a few people throwing their potato-based snacks at me as I passed them in the hallways or in the cafeteria. And I hated myself for it. I remember being no older than 8 or 9 in the shower. And I remember thinking to myself that if I just scrubbed off this 'dirty' top layer of skin, I'd be white and perfect and people wouldn't be so mean to me. I was listening to somebody else talk about their experiences with bullying once and something she said stuck in my brain for a long time as not being right. And I couldn't work it out until recently. She said that she'd been asked what her favourite music was and then was bullied because of her choice. And she said something along the lines of 'if I had just said something else that other people would have recognised things would have been different' - and this makes me sad. This is another example of victim-blaming and it makes me incredibly unhappy. Because I was bullied for not conforming with other students in my year. I didn't dress like them. I didn't listen to the same music. I enjoyed school, I loved to read. And it was not my fault for being bullied. I was bullied for being different but that doesn't mean that anything in the way I looked or anything I said or did was wrong. The fault was not my own and it is never the fault of the victim either. I didn't see that as I being bullied but I definitely do see it now. 1. Let you know that if you are being bullied that you are not alone. I've experienced it, others have been in your same position. It isn't something shameful or personal to you. Speak to someone, get help. 2. If you are being bullied, please know that it is not your fault. It may not seem like it right now, but there's nothing wrong with you. You're fine just the way you are. You deserve to live your life the way you want to live it and to be the person you are without bullies stripping away your happiness or your confidence. 3. If you are being bullied, I really want you to know that things will get better. It's tough now and I'm not going to lie: it's going to be tough for a long time. But things have a way of getting better. Find great people to surround yourself with. Find something you love to do, the rest will follow. Fabulous post Michelle and those pictures of you as a child are adorable :-) I'm sorry you had to go through that (I suffered with a lot of bullying at school myself so I know where you're coming from!) but I think you've probably come out stronger on the other side because of the experience! Thank you, Sarah! I wouldn't go back to my school days either... ! Great post, Michelle. Nearly everyone gets bullied at some point and I think it's important to realise that, and you're not alone in it. I was bullied in secondary school and although it hurt, a lot, the experiences has made me stronger and built me into the person I am today. Thank you, Anya. I'm really glad to hear that you've taken such a positive outlook on your experiences with bullying! Fantastic post Michelle! Although I'm so sorry for everything you went through. To be bullied because of your race is just cruel - although I bet at the core of it they were just jealous. You're beautiful! If you have any doubts look again at that photo of yourself in the tie-dye t-shirt. You look so nice! And the glasses are really cute! I'd love that if that happened, yes!